Did you know that the Canary Islands are one of the three best spots in the world to observe the sky, along with Chile and Hawaii? This is why we are fortunate to have the Teide Observatory, the world’s largest solar observatory, here in Tenerife, located at an altitude of 2,390 m.
The Teide Observatory began to operate in 1964. It is home to many solar and nocturnal telescopes, owned by different European countries. It focuses on solar observations and robotic astronomy. This trip is a perfect opportunity to spend a day at the weekend completely differently with your family by getting an up-close look at this important scientific centre, which is on your doorstep. You and your family will be introduced to the importance of the sky in the Canary Islands, the Teide Observatory telescopes and the different projects of the Canary Islands Institute of Astrophysics. You and your children will participate in an astrophysics workshop, held in the Teide Observatory visitors centre, where we shall explain in a fun and enjoyable way what astrophysics is and how the astrophysicists in the Teide Observatory conduct their research. You will cherish the look of amazement on your children’s faces when they see the sunspots and solar flares through our two solar telescopes. Afterwards, when you are in the car on the way home, you can all talk about the experience that you have just shared! As a family, you will experience the same feeling of amazement inside the nocturnal telescope when you find out how it works and discover the impressive story behind each of its parts. You and your family must be at the Teide Observatory gate 30 minutes before the tour is scheduled to start. If you do not arrive on time and the visit has already started you will not be able to enter the Observatory. 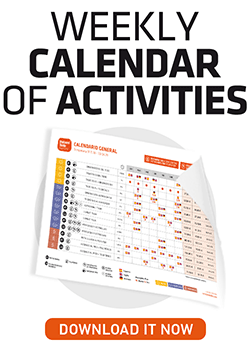 Remember that it is necessary to produce the booking confirmation for the guided tour of the Teide Observatory for families, either printed or displayed on the screen of a mobile device, such as a smartphone or a tablet. If you show symptoms of dizziness, nausea, shortness of breath, ringing in your ears, plugged ears or headache during your visit, please,immediately inform your guide. We ask that you be very punctual. Bear in mind that the Observatory is located at an altitude of 2,400 m and that you must travel on high mountain roads to reach it. Therefore, please make sure that you calculate well the time needed to reach the Observatory. YOU MUST ARRIVE AT THE TO’S GATE AT LEAST 30 MINUTES BEFORE the scheduled time of the visit. Upon your arrival, you will be instructed by our personnel where to go. If you arrive late, the visit will be cut short (but it will never be extended) by the same amount of time, andcan even be cancelled if the delay is considerable and it causes problems for later scheduled visits. Children under 5 are not allowed to participate in the guided visit of the Teide Observatory for families. In order to access the Teide Observatory it is necessary to either have own transport or book our transfer service. If you plan to arrive by taxi, please take into account that it will have to drive you inside the premises, since the installations are 2 km away from the meeting point at the access gate, and the driver will have to remain on the premises until the end of the activity. It is not allowed to access the premises by bicycle. Remember that you must arrive at the TO’s gate at least 30 minutes before the scheduled time of the visit. Upon your arrival, you will be instructed by our personnel where to go. 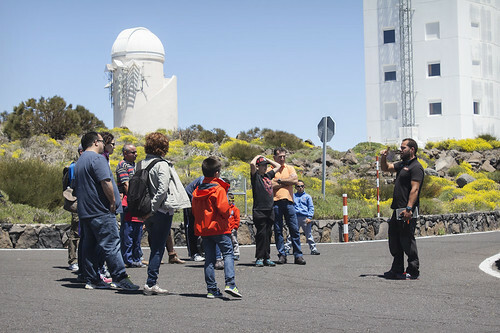 In the event that weather conditions impede access to the Teide Observatory, the amount paid for the guided visit for families shall be reimbursed. Our facilities include public toilets. Please take into account that the toilets are a 10 – 15 minute walk from the car park. The Teide Observatory is located at an altitude of 2,390 m, in Izaña, on the island of Tenerife (Spain). The entrance is located at km 1 of the TF-514 motorway, which can be accessed from km 37 of the TF-24 motorway. It takes approximately two hours to reach the Teide Observatory from the south of the island, an hour and a half from Santa Cruz, and an hour from Puerto de la Cruz.